Mrs. Kate told me the story behind her song "Hot Boiled Peanuts". "I travel a lot up and down Highway 301 in Florida as a touring musician. I always see the Hot boiled peanut vendors up and down the road. One day I actually decided to stop and try some, and that's how the song came to be. I figured these hard-working guys and gals needed a commercial. Often when I see a roadside boiled peanut vendor, I will stop, roll down the window of my van and call them to my car. I'll pop in the Florida Family Folksongs CD and play the Hot Boiled Peanuts song for them. Often the response is that they want to buy the CD, which I gladly sell them for $10. Then they can play the commercial for their customers! I recorded this song in 2004 and it has consistently been purchased and downloaded ever since. It's a great road song and I appreciate all the musicians, and my kids vocal team that contributed to the studio recording. The song is available on I-Tunes, CD Baby, Broadjam, and all major internet music stores." Listen to this delightful song by Mrs. Kate here. "Hot Boiled Peanuts" lyrics, and music copyright 1997 Kate Carpenter. All rights reserved. and I wonder if I can pass it up this time. Hot boiled peanuts. Hot boiled peanuts. I like ‘em. You like ‘em. Hey we all like ‘em. with a smile so wide, and his tailgate load. In his truck, he’s got a pot. Now I know I gotta have some! I’ll be scarfin’ down peanuts ‘n singin’ my song, Oh baby! Hot boiled peanuts. Hot boiled peanuts. Hot boiled peanuts. "Mrs. Kate" Carpenter hails from the tiny town of Callahan, Florida, and travels throughout the southeast making families smile with her homespun folk music. Accompanying herself on the guitar, this prolific songwriter has recorded 10 original CD's and a children's music video in the past 20 years. 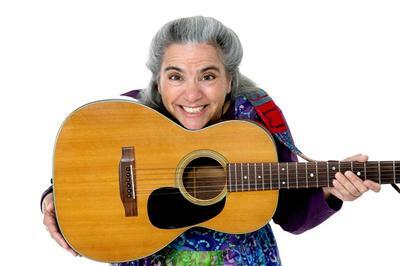 She performs over 150 shows a year, delighting audiences of all ages. Mrs. Kate’s specialty is electrifying elementary school children. Using catchy tunes, puppetry, unusual instruments, and riveting storytelling, her interaction with the audience is creative and unforgettable. She has inspired students in over 330 schools with her "Motivate with Mrs. Kate" show. Summers find her touring the public library circuit, promoting reading with her "Crack a Book" song and the unforgettable "Hug-a-Bug-a-Boo." Visit her website, www.MrsKate.com to listen and learn more. Bret, I love it! You did a fantastic job. I will send this link to my fan base. YOU TOTALLY ROCK. God bless you bigtime.